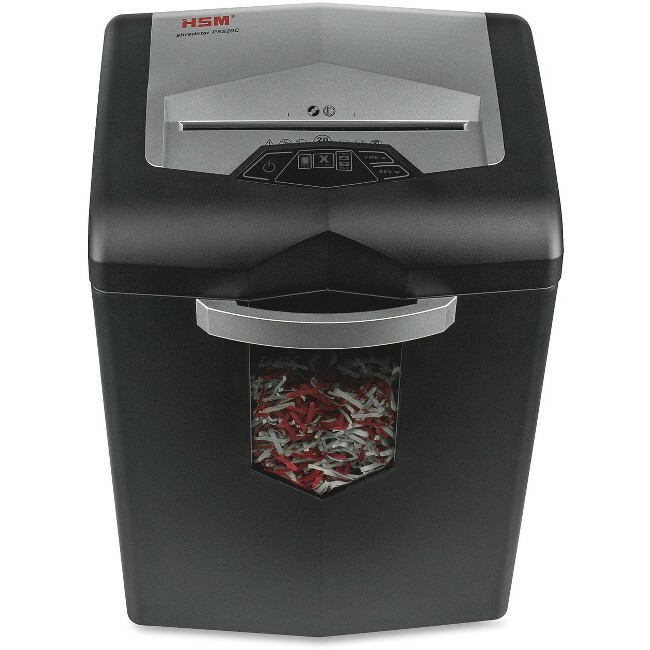 Cross-cut shredder offers simple-to-use features in a convenient design and tackles small amounts of documents and data with the touch of a finger. Continuous-duty operation ensures continual shredding with no downtime. Ideal for personal/home office use, the Shredstar PS820c powers through 20 sheets per pass, creating 430 cross-cut/confetti particles per page with a whisperlike noise level during shredding. It can also shred staples, paper clips, credits cards and CDs/DVDs. JamStop Anti-Jam Technology prevents jams when machine is overloaded. Energy Management Control System reduces power consumption by up to 90 percent. Casters allow mobility around your small office/home office. 7.1 gallon pullout waste bin allows easy waste disposal. Design also features manual/automatic reversing functions, automatic start/stop, full bag indicator and overload protection.